He’s a handsome billionaire. She’s not impressed. Katie McKenna has never loved any man but one: billionaire Luc DeForges. He was her first love. But there are a billion reasons why she’s engaged instead to Dexter Hastings, a solid and stable man who wants the same things she does: marriage and a family but all of the things that she wants without the deep-seeded pain and fear of being abandoned that Luc brings. Dexter and she have worked an arrangement that’s akin to faith without action, love without deeds — a dead faith. Going home to New Orleans to sing for her childhood friend’s wedding, Katie must search her heart to find out if any of her reasons for being with Dexter are stronger than love. Only when Katie steps fully into faith and jumps off the cliff of life into the arms of Luc does she understand the fullness of God’s grace. Ah, marriage. And engagement. Two things that I never really thought much about up until my brother got married. Now it feels like everyone around me is getting engaged or married. How many old female high school friends have changed their surnames (or at least, added their husband’s surnames to their names? How many friends in high school and college have I seen change their status from “In a Relationship” to “Engaged”? Sometimes they take me totally by surprise, too, only because they seemed so timid and shy back when I know them and now they’re getting married and starting their own families. It doesn’t make me want to get married yet (well, maybe a teensy part of me wonders — just a small part, because hello, I don’t even have a boyfriend yet), but it makes me realize that maybe I am at that particular season of my life where everyone around me is getting married and I’m…not. Talk about a chick lit novel. I knew my life can be qualified as a chick lit novel. That may be one of the reasons I decided to read Kristin Billerbeck’s newest novel for Valentine’s weekend. Kristin Billerbeck wrote the Ashley Stockingdale series, one of my favorite Christian novel series, and I was thrilled to be able to request a copy of her newest book, A Billion Reasons Why, from Booksneeze. Katie McKenna has been burned. Badly. She loved Luc DeForges with all her heart eight years ago, but he rejected her publicly, causing her to run away to build herself up again, even going to California shortly after her father died. Katie has found a new life in California with her best friend, teaching special kids. She was also about to be engaged to Dexter Hastings, a simple and stable man who wants to settle down and have a family like she does — basically everything that Luc is not. However, in comes Luc again, now a multimillionaire and still with an oozing charisma that Katie could not resist, asking her to sing for his brother’s wedding. Truth be told, this felt a little bit harder to read to me compared to Ashley Stockingdale. The Ashley novels read a lot like Sophie Kinsella’s Shopaholic series but with a geeky and Christian flavor. A Billion Reasons Why brought me into the world of New Orleans and 40’s music and movies, things that I am not too entirely familiar or fond with. This definitely had the author’s style, though — the over thinking heroine, the hot guy who knew the right words, the other, somewhat boring guy, the in-your-face best friend and the somewhat crazy mothers. I had a hard time following the story and though, because I was plunged right into the action from the start. I spent almost half of the book wondering what exactly Luc did that embarrassed Katie until it was finally revealed, and by then I felt like my attention has gone somewhere else, like reading about tattoo removal or something. It also felt that some characters were quite inconsistent with their affections, like Eileen, Katie’s best friend. She would rag on Luc then rag on Dexter, and she was really getting annoying at some point. Sometimes some of the characters felt a bit one-dimensional, particularly the one touted as the antagonist. It was an automatic dislike for the character from the very start. I think from the blurb alone, you know what’s going to happen and who Katie is going to choose, and it really didn’t give me much of a thrill when things unfolded in the book. Stability and good faith in a relationship is good, but without love, what’s the use? And I don’t think you can call it true love without the commitment and stability and faith. He didn’t ask for the job, but now all that stands between us and chaos… is Colt. Colt McAlister was having the summer of his life. He spent his days surfing and his nights playing guitar on the beach with friends. He even met a girl and got his first car. But everything changes when his parents are killed in a freak accident. He’s forced to leave his old life behind and move to Arizona with his grandfather. The only person he knows at the new high school is a childhood friend named Dani. And Oz, a guy he’s sure he’s never met but who is strangely familiar. But what if his parents’ death wasn’t an accident? His mother, an investigative reporter, was going to expose a secret mind-control program run by one of the world’s largest companies. Before she could release the story, what if agents from Trident Biotech made sure she couldn’t go public? Vowing to uncover the truth, Colt gets drawn into a secret world of aliens, shapeshifters, flying motorcycles, and invisible gateways. I wasn’t sure what to expect when I requested Invasion by J.S. Lewis from Booksneeze, so I had zero expectations when I started reading the book, too. Invasion is the first book in the C.H.A.O.S. series, and the first book tells the story of Colt McAlister, orphaned at 16 after his parents died in a car crash. Soon after he moved with his grandfather in Arizona, weird things start happening such as weird creatures chasing him, and random people trying to kill him for some reason. Soon Colt finds out that his mom was about to release a story about mind-controlling chips from a huge and powerful corporation, Trident Biotech. As Colt tries to uncover the mystery of his parents’ death, he runs for his life with his friends and he encounters all weird creatures and high technology, and he realizes that there may be more to this than he thought it was. Invasion has 57 chapters, which I found a bit daunting when I started reading. These were short chapters, however, which made it for easy albeit a bit shallow reading. There is strong world building in Invasion, backed with interesting facts and information with how aliens and different creatures have been hidden among humans since the start. If you liked the setting in Men In Black, this book provides the same kind of world. Just like other books that involved conspiracies, action wasn’t lacking in this book: chase scenes, fights, random people trying to kill the heroes are a-plenty here. There’s also enough secret hideouts, mysterious people and advanced technology to excite sci-fi fans around. However, I never felt invested in the characters. I liked Colt, Oz and Danielle, but I didn’t feel like I knew them for real. It may be because of how the story flowed or maybe even because each chapter is too short for me to glean much about who they are and what makes them tick. There also seemed to be a crowd of secondary characters all over the place, and while I get that it’s needed to build the new world that Colt is moving into, it was kind of hard to keep track of them. The overall premise was interesting, and it does make for an interesting read but I felt that I would be more interested in this if it were a movie instead of a book. I think Invasion is still a good book, but I think it’s not for me. Perhaps it’s my age, or my lack of scifi knowledge and love. I like my aliens and wild worlds with chase scenes and explosions, but this one just failed to capture my interest. Maybe younger boys or longtime scifi fans would enjoy this more than I did. 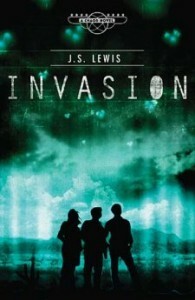 Invasion by J.S. Lewis is already out in hardcover, published by Thomas Nelson. Thanks to Booksneeze for the review copy. → I didn’t really finish the book, but I thought it had enough potential to get a 3-star rating. I meant to do an IMM post last week but I can’t remember why I skipped it. Perhaps it was because I had too many posts lined up. That, or I just felt lazy doing one. It was kind of a good thing, though, because it turns out I don’t have my camera cable at home so I couldn’t transfer photos, anyway. In My Mailbox is a weekly book meme hosted by Kristi from The Story Siren, where bloggers post about what books received that week, be it via mailbox, library or store. Here’s this week’s stash! 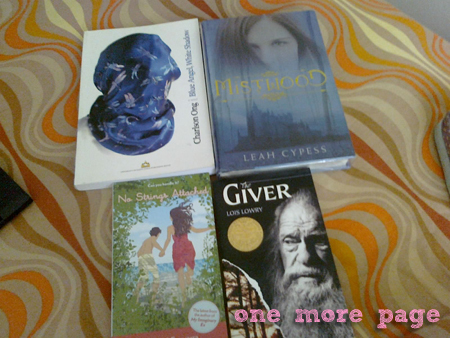 The Giver by Lois Lowry (National Bookstore) – I got this because I was thinking of getting Matched, but I thought I’d read this one first since Matched has been compared to this a lot. I already posted my review here and suffice to say I really liked it. :) Will I get Matched now? Still not sure — what do you think? No Strings Attached by Mina V. Esguerra (National Bookstore) – I’ve been hounding the bookstores for her newest book after she told us about it in Twitter, but alas, it’s not in Eastwood. Then she tweeted that she saw it already, and since I can’t find it anywhere near I work, I took a special trip to the mall near our place and found lots and lots of copies. :D I finished reading this last week, will post a review next week. Reaper by Rachel Vincent (Amazon Kindle store) – I found out this ebook is free from the store, and I can never resist free ebooks. :) I must finish reading the rest of the books in this series. 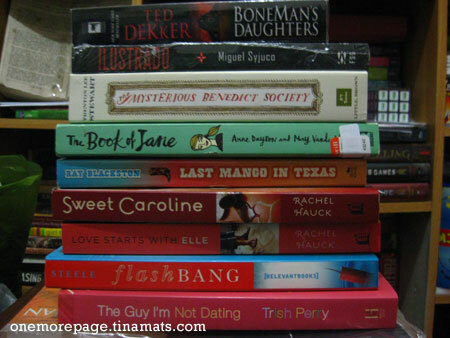 Next week, it’s our Goodreads group’s Christmas party, and I’m sure there will be books to bring home there again. :) But that’s for next week. I still have to shop for presents for that! Now I shall get ready for my godsister’s wedding. :) Have a great Sunday, everyone! When a car accident leaves a famous movie star in a coma, nurse Kemp McAvoy thinks he has found his ticket to the life he’s always wanted. As a med school dropout who was on his way to becoming an anesthesiologist, Kemp has the knowledge to carry off the crazy plan he concocts: adjust the star’s medication each night and pretend to be a heavenly visitor giving her messages. He recruits her agent and a down-and-out publisher to make sure the messages will become the next spiritual bestseller and make them all rich. But his girlfriend’s daughter, Leah, keeps telling people that she is seeing angels, and her mother and her teachers are all afraid that something is wrong. Before it’s all over, they’ll all learn a few things about angels, love, and hope. I invest a lot of emotions when I read a book. I am very particular with characters, and strong characters always make a mark in me, even if the plot is typical. Most of the books I marked as favorite are books that leave me both sad and satisfied at the end, books that I felt that the characters were not only people inside a book, but people who have become my friends. 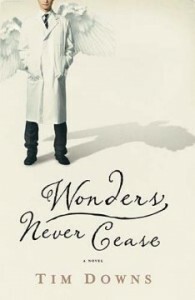 When I saw Wonders Never Cease up for grabs at Book Sneeze, I grabbed it because I thought this is one of the books where I would find friends. I figure, it’s a book about impersonating an angel, and there’s got to be a lot of hilarious moments here, and redemptive moments as well. The blurb alone sounds like a movie, and it seems like a heartwarming read. Spoiler warning here on out! I’m sorry for not posting as much as I used to here — truth be told, I’m just having a hard time finishing the books I’ve been reading. Ever since I finished North of Beautiful, I haven’t been feeling much of the other books I have on my to-be-read list. Sure, I’ve got some reading challenges to guide me, but I just wasn’t feeling them that much. Ever had one of those days? I picked this up to add another book in my Project 20:10 Challenge, and Blooey just gave a glowing review on this, and I can’t wait to get started on this. Should be good. I’ve seen a couple of recommendations on this by Blooey and Myk, and the paperback is quite cheap, too, so I got it from Powerbooks. Looks promising, but it’s another series, so I think I’m going to have to collect this, too. I’ve been meaning to get this one ever since I started writing my 2009 NaNoWriMo novel, but of course it’s not available here. When I did my Amazon shopping, this was the first one I got — and I got it for only $5! I’m reading it now and liking it, although I already guessed something from the story the moment the character showed up. :P But’s it’s still good, and I’m glad to have gotten my hands on some good Christian fiction again. I’m a big Ray Blackston fan, from his Jay Jarvis series. I was surprised to see that he has new books out, and this was the cheapest I could find. I look forward to laughing with this once again. For #6 and 7, they seem interesting, and it was on sale, too, so I got it. Good Christian chick lit, how I missed you! I have actually read this book already, but I had to throw away my copy when Ondoy hit. :( Good thing there was a sale on this, too! Got Getting this from Booksneeze — I finally caught a fiction release from them! Pays to have them in my RSS reader. 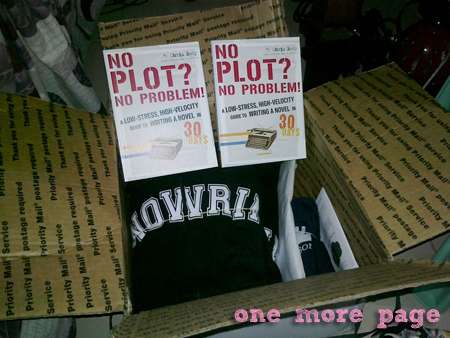 Now if only shipping books from where they are to where I am does not take two weeks, I can write their reviews faster. But oh well. Free books are free books, I shouldn’t complain. I hope the book arrives soon, though!